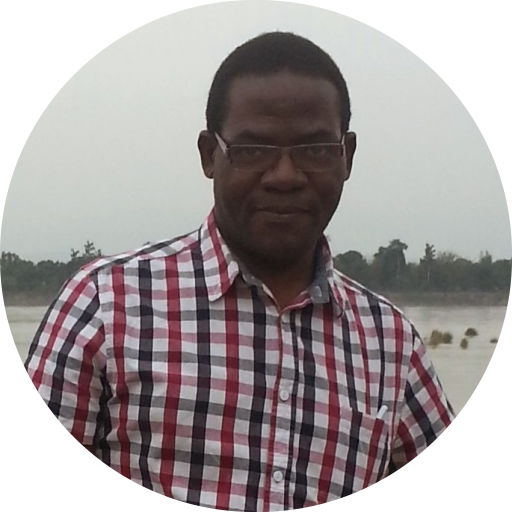 Charles Ssonko is a HIV/TB advisor based in the Manson Unit – a specialist medical innovation team – at MSF UK. 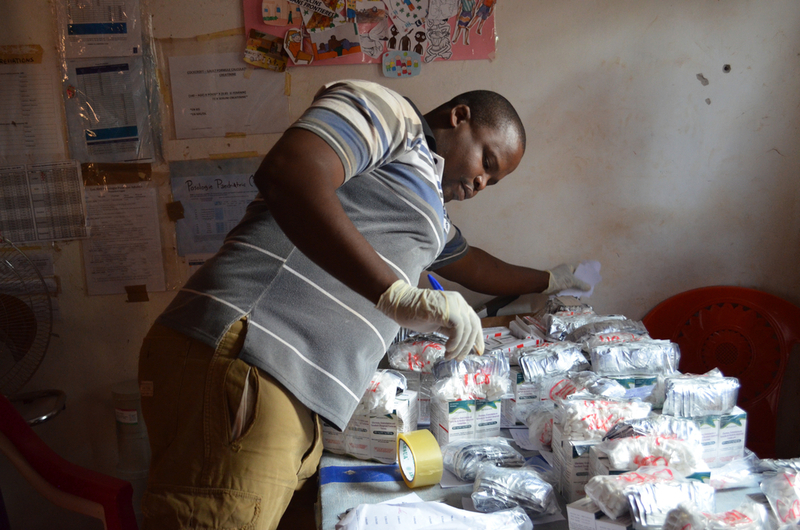 As part of his work in the Central African Republic, Charles blogs about a series of innovative groups that have empowered HIV patients even in times of conflict. On 28 June 2017, violence broke out in the border town of Zemio. The departure of the Ugandan army based there left the town vulnerable, and soon there was an outbreak of violence. This conflict forced many of the residents to take refuge in the Ministry of Health hospital supported by Médecins sans Frontières / Doctors Without Borders (MSF) which included an HIV clinic. With violence escalating, the hospital compound was no longer safe. Both the refugees and health workers fled across the border into the Democratic Republic of Congo (DRC). They left behind a stockpile of medication. Among these medicines were antiretroviral drugs used for treating HIV. In the neighbouring Democratic Republic of Congo, many of the people who fled then found themselves living in refugee camps. The main entrance to MSF's base in Zemio after it was destroyed in summer 2017. However, the lack of HIV drugs within the refugee camps resulted in extraordinary acts of bravery by the community leaders and the health workers, as they crossed the bullet-ridden frontline to reach the drug lock-up within Zemio. I believe this bravery was inspired by the innovative HIV community antiretroviral groups (CAGS) that we had established. Human Immunodeficiency Virus (HIV) is a dangerous illness. The virus uses certain cells within the immune system to reproduce through a process called “viral replication”. Once the virus has replicated, the cell is destroyed. Over time HIV destroys the patient’s immune system, leading to a condition known as “advanced HIV disease”. When patients have this condition, even illnesses such as a common cold become life-threatening. Thankfully, treatment is now available through a course of drugs known as antiretrovirals. They prevent the virus from replicating and destroying the patient’s immune system. Ongoing antiretroviral treatment can help control patients’ HIV levels, allowing them to lead long, healthy lives. I first visited Zemio in 2015 to evaluate the HIV programme that MSF had established that year. It took me three hours by chartered plane from the capital Bangui to reach the rural town. During my time in Zemio, I was struck by the large numbers of HIV patients that the team were treating. I learned that 12 per cent of all the town’s inhabitants suffered from this condition. The highest rate in the country. As I spent more time in the project, I noticed that many of the patients MSF was treating were travelling massive distances, often by foot, to collect their antiretroviral medication. However, travel on the local roads was a very perilous endeavour. There was a high chance travellers could be abducted or robbed. These issues made me think that the best way forward was to try and introduce community antiretroviral groups, known as “CAGs”. These groups consist of patients on antiretroviral therapy – known as ART – from a community in the same geographical location. Each group has a leader who is responsible for collecting the drugs from the central clinic. The collected medicine is then distributed around the community. These groups enable patients to gain autonomy and responsibility for their treatment, and can also help to destigmatise HIV and its treatment as it becomes part of community life. My idea to introduce these groups did not immediately work out. 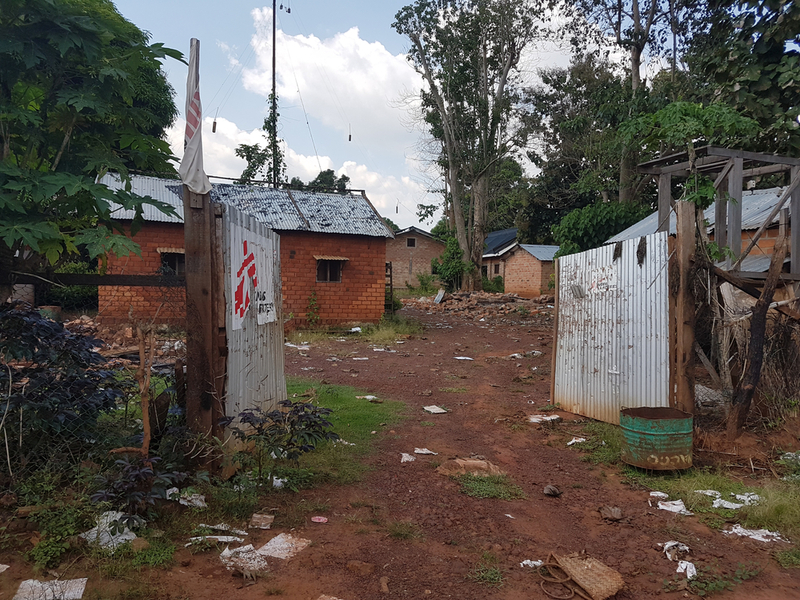 The MSF team in Zemio decided to counter these challenges a different way: by decentralising drug distribution to a series of smaller clinics closer to the communities. At this point, the security situation in Zemio was quite stable. This made the town relatively safe compared to other areas in the Central African Republic such as Boguila, Bossangoa, Bambari, and Bria, where there was frequent fighting. With the civil war taking a heavy toll on other regions of this volatile country, MSF decided to focus on providing medical interventions to people living on the frontline. That meant handing the medical activities at the Zemio centre over to the Central African Ministry of Health. The HIV programme and how best to continue to support patients – given the country’s limited healthcare structure – became a pressing issue. The team in Zemio decided that MSF should use community groups to continue the programme. In November 2016, I returned to Zemio to help the MSF team start these groups. We mapped all the patients and found they were coming from four main areas along the main roads into Zemio: from the towns of Bangassou, Obo, and Bahr, and across the river from the DRC. We also found out some patients were travelling from neighbouring countries such as South Sudan. Amazingly these patients were travelling up to 250 km by foot to reach the clinic. When MSF began introducing the groups there were 1,650 patients registered and 1,500 were receiving drugs. By June 2017, of the 1,500 patients on HIV drugs, we had enrolled 1,057 patients into 74 different community ART groups. Alongside the community groups we also had 443 patients transferred to “pharmacy fast track”, a programme for stable patients who are not in the community groups. Pharmacy fast track patients collect their medication once every six months and have their HIV levels tested once a year at a clinic. The community ART groups include patients with no less than six months of using HIV drugs and no presence of any other serious illness. Uniquely, they also include pregnant women. Previously, community ART groups in different countries had typically been very selective about who was included. In the case of Zemio, we wanted to sign up as many patients as possible. 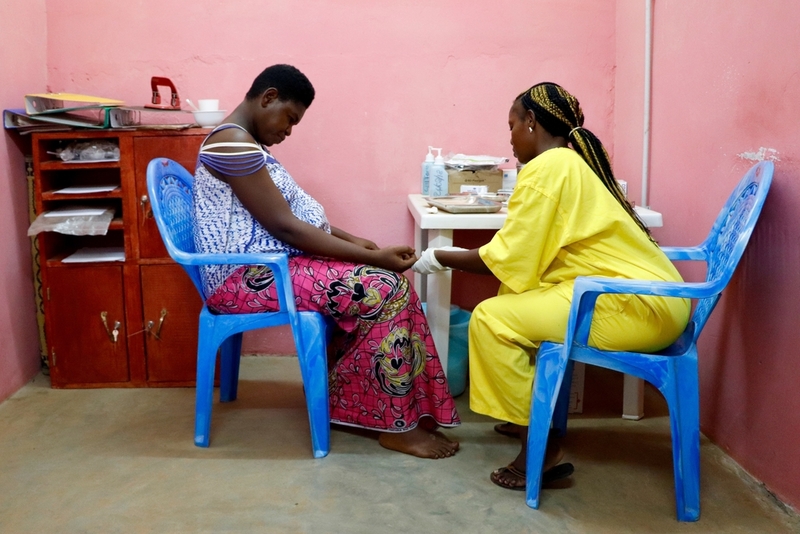 Including pregnant women in the groups has meant they could be encouraged to take their HIV medication and attend their antenatal care appointments - which also encourages them to deliver their babies in the safety of healthcare facilities. When Zemio was plunged into conflict and the residents were forced to flee between June and August 2017, the challenging situation provided an early test for these groups. During the conflict 413, (39.1%) patients still had access to HIV treatment. Without these community groups I think we would have seen a much lower number of patients being able to access medicine during the outbreak of violence in Zemio. The survival of these groups in conflict offers hope for the future. We are beginning to see patients lose their stigma towards HIV and take control of their condition. I hope that soon, thanks to the innovation of community care groups, HIV will become much like diabetes, a patient-managed disease.